I am curious if someone knows the proper way to determine the overall odds of drawing at least one tag when applying for multiple draws/units in a true raffle state. For example, if I apply for elk and ibex in New Mexico and my odds for drawing an elk tag are 10% and the odds of drawing an ibex tag are 2%, what are the odds that I draw at least one of those tags? I appreciate any insight, thanks in advance. If all the events happen (an "and question") Multiply the probabilities together. In this case, 10% +2% = 12% odds of drawing either tag. If this were expressed as a word problem, your answer would be "slim to none." Yes, I googled it, so don't PM me w math problems, please and thanks. OP, I feel your pain, bro. I believe that is only true if the events are dependent, ie the chance of rolling a 1 or 6 in a dice roll is 1/6 + 1/6. If the events are independent they are not additive. OP has the odds that are given, 10% and 2%. Here is a basic calculation I found for different Raffle draws. It went through a bunch of chances at one draw, or multiple chances in different draws. Def seems like putting in more draws adds to your chances. Here we can put up to 6 per species all on one tag is wanted, maybe all on one tag isn’t the best plan as I have done on some tags in the past. The calculations here were all 6 in one drawing or 1 in each drawing. 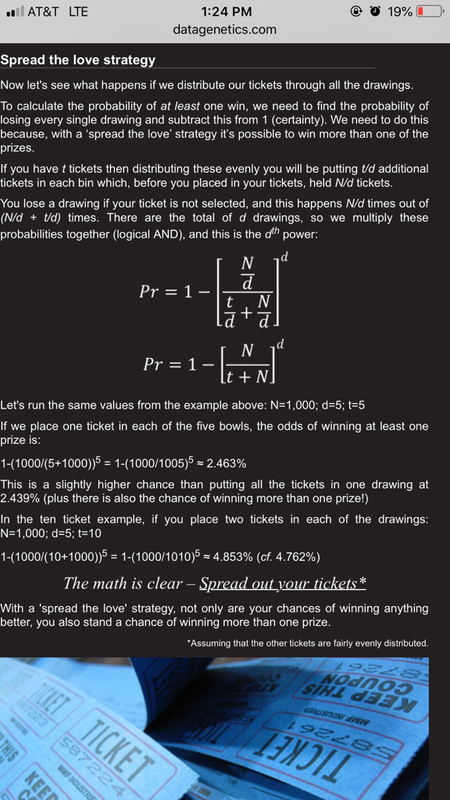 Upped your chance of one win based on their math from 2 to to 2.4%. Multiple the odds of not drawing. Subtract from 1 to find the odds of drawing something. .9x.98=.882= 88.2% chance of drawing neither. 1-.882=.118=11.8% chance of drawing something, including the 0.2% chance of drawing both. The calculations here were all 6 in one drawing or 1 in each drawing. Upped your chance of one win based on their math from 2 to 4%. This is why I love living in Idaho. No points. No dudes buying points for 12 year olds. No points squared nonsense. No unlimited OTC nonsense. It's a lottery ticket every year if you want that trophy tag. I'm putting in for deer, elk, pronghorn, fall bear, and the super hunt super lotto. The plan is to burn boot rubber and fill SD cards in my OTC spots until draw results are posted. Then probably more of the same. This is the correct answer. When you multiply probabilities together, you're calculating the chances that all events (each drawing is an "event") come true. But in the case of tag drawings, we're not interested in the probability that ALL events come true at the same time, we're mostly interested in what are the chances that at least ONE will come true. So basically, you have to calculate the chances that ALL will NOT come true at the same time, then subtract that from 100%. You do this by multiplying together the probability of failure of each event, just as DCB showed in his calculation. I know, clear as mud, right? DCB/Johnboy thank you, that was very helpful.